I feel like I've still got the dim sum craving. So, last night, I scoured the Internet for a list, there must be one! Someone must have compiled a list of the best places to eat dim sum! The Eat Out team have this amazing list on their website. I'd heard that there was a cool place in sea point that sells yummy dumplings at a good price, I scoured the list looking for it. Enter Jing Jing Hesheng. 70 main road, sea point. Google maps landed us up at mr chan's. We turned around and did it the old fashioned way, looking at the numbers, which was hard to do in the dark streets of sea point where the people drive like cowboys. We eventually found it, then spent another couple of frantic minutes looking for a spot to squeeze in my car. We walked in, me wearing black jeans, black jacket, white shirt, leather handbag and shoes. The room greeted us with a scream of neon lighting, pleather table cloths, and floral seat covers complete with a nylon frill. Yes. I had over dressed. Yes. This was the place. I just knew we were gonna get amazing food here. I got excited, we ordered some drinks and stared at the menu wanting everything. There was a poster on the wall with pictures and descriptions of all the food. 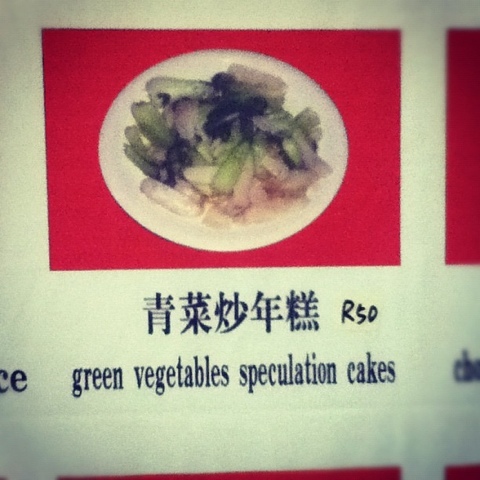 My favourite picture was the "green vegetables speculation cakes" followed by "laver & egg soup"
We ordered the pork fried dumplings, R40, they arrived at the table hot and piled up on a plate. Gene and I ate them like a couple of wild animals, ripping apart the little sacks with our teeth, squirting the juices everywhere. My word, they were delicious! For mains, Gene had the chicken cashew dish with rice, he only just about finished it. I ordered the chicken noodle soup with looked exactly like Gene's but with different nuts and noodles in soup. It was gigantic. I couldn't finish it and I ate it for breakfast the next day. This is basically my new favourite place and you'll probably find me there often from now on. Gene and I have been craving some dim sum. 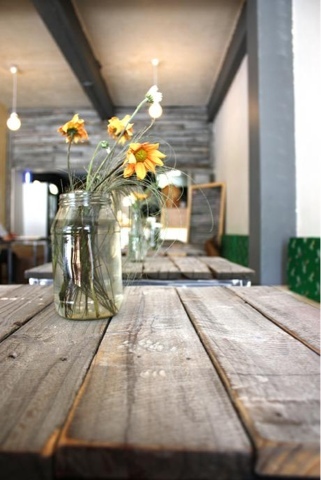 I'd heard about the new place on long street and had been wanting to get in there for weeks. As I walked into South China Dim Sum, it was packed with local folk and only about 3 people who I didn't know. I bought some beer and wine and sat down with Gene to peruse the menu. We ordered the noodle salad with chicken and a portion of dim sum, as well as this round doughy thing I can't remember the name of. All the food is served in eco friendly take away containers, which I'm not sure if I love or hate. The noodle salad was tasty and fresh but a little bit pricey for the size (R40) We ate our dumplings, which were delicious. The plate comes with three dumplings for R28 and was just too delicious for sharing. I ate a noodle dumpling (pork and shrimp filling) because I was still hungry which was really tasty. Gene and I can both eat. A lot. So, this was not an incredibly filling meal for the price, but was big on quality, taste and the restaurant's stripped down aesthetic.